Toyark sponsor Entertainment Earth has opened up pre-order for some great new items in the Mega Construx line. They have a Masters of the Universe Mega Construx 5-Pack as well as a Wind Raider Pro Builder Set available for pre-order! these items are due out later this year. The five figure set includes He-Man, Skeletor, Faker, Teela, and Beast Man. 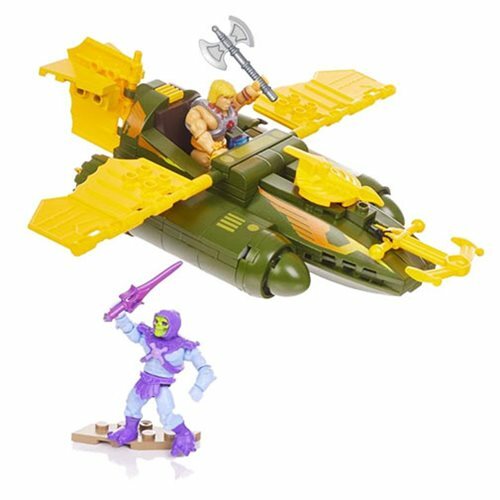 The wind Raider is a 200+ piece set that also include Skeletor and He-Man. Check out pre-order links and details below. From Masters of the Universe comes these detailed Mega Construx MCX Heroes Mini-Figures! 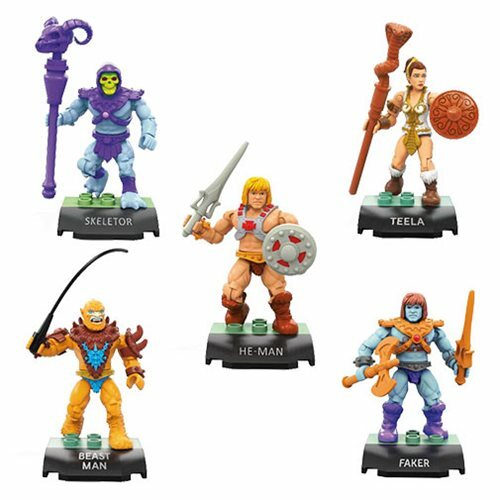 The Masters of the Universe MCX Heroes Collector’s Edition Mini-Figure 5-Pack contains 5 original characters: He-Man, Skeletor, Teela, Faker, and Beast Man. Each 2-inch tall super-poseable figure features up to 13 points of articulation, comes with authentic weapons and accessories, and includes a color-coded display stand. The Masters of the Universe MCX Heroes Collector’s Edition Mini-Figure 5-Pack comes in blister card packaging. I don't have my He-man or Skeletor on hand at the moment, are there any differences between them and their single-carded counterparts? If not, I am glad I waited to pick up Teela and Beastman if Faker is an exclusive. About time! Hopefully they'll do more. These have a lot of potential. And hopefully if these sell well, they'll do other sets from wider eras. I'd really like to get a sorceress, man at arms, Hordak, evil-lynn, and she-ra in this scale alongside some 2k2 designs. A battlecat and panthor would be nice too. New Adventures might be cool to have to go with Destiny and Halo too. The 5 pack looks like a straight up re-release of the single carded with the Faker as a recolored he-Man. The vehicle set on the other hand looks like it has metallic paint apps on the weapons, and some other little paint differences like Skeletor's feet being solid purple instead of only the ankle armor like the 5 pack. I'd really like to get a sorceress, man at arms, Hordak, evil-lynn, and she-ra in this scale alongside some 2k2 designs. You're in luck! 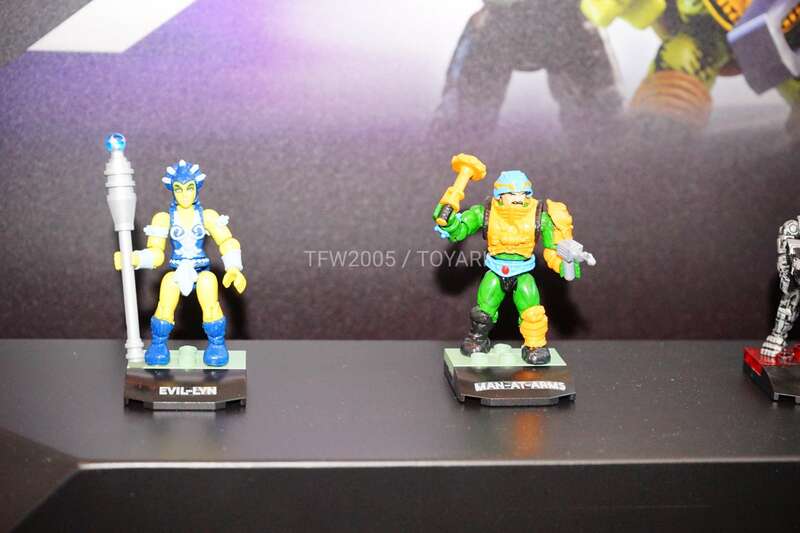 Evil-Lyn & Man-at-Arms were both shown-off at ToyFair for future release down-the-line. Faker is in wave 3, Man at arms and evilyn are in wave 4. Love it! This line is superb. Hopefully they put out a few more sets. The Mega Construx sections everywhere I go feel like they're always shrinking and it's not okay. Very cool, hopefully we can get a castle greyskull at some point. 2 down, 3 more to go! But likely if the expanded sets sell well, they'll do bigger and more varied sets too. This seems like it's a water-testing release to see if the market demand is there since the single carded have been doing well. If the demand holds, and sales show it worthwhile, they'll do wider sets. Castle Grayskull. Snake Mountain. That machine horse, and whatever else fits. Would definitely buy a she-ra set that was her and Hordak with her Pegasus included too. But I also want more towards the 2k2 Hordak and less the comedic magic cyborg of She-Ra's series. Something more from nightmares, less of something likely to slip on a bar of soap and impale itself on it's own weapons. Sweet. I'm tired of hunting for a Teela that my local resellers bought up months ago. These are the only block stuff I'll buy in for. I love these little dudes. Really hope they do a lot more characters and vehicles/play sets. five pack figures are identical to singles. for the first four at least. I guess, anyway, on Fakor, since it's not yet out. The Wind Raider figures appear the same (with the above noted boots-instead-of-bare feet on Skeletor) but have different weapons. It'll be the only way to get Skeletor's Power Sword, I'm sure. source: I've had Skeletor and He-Man sitting on my desk for months. um, those links require an account. can you post a screenshot instead? I wonder if they'll do more tied to the new Dreamworks She-Ra netflix series coming soon. If so, that could rock. I'm still not sure how to react to the "Thundercats Roar!" new show that seems like Titans Go, Steven Universe and star vs the forces of evil as well that other KO Hero CN show merged together. But hey, uh, at least we're getting She-Ra netflix by Dreamworks?